In 2014 artist Ai Weiwei recorded himself reading aloud the names of the 5,196 children and young people who died in 2008's Sichuan earthquake, which he and thousands of bloggers collected after the Chinese government refused to release the names. He then made his recording available for other artists to interpret. NameQuake condenses all 5,196 names into two minutes - the approximate duration of the earthquake which killed them. 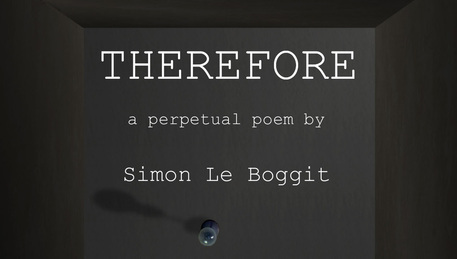 Sonophilia Programme press release: Hear the world premiere of Simon Le Boggit's computer manipulated perpetual poem THEREFORE, sonically haunting Lincoln Drill Hall’s toilets throughout the Sonophilia festival. “I originally wrote the static poem THEREFORE back in the 1980’s. I was suffering from a very painful mystery disease, which was later diagnosed as a form of spinal arthritis. The poem was my rather futile effort to express the mind-altering state that can arise from relentless pain, fatigue and uncertainty. Although I was happy enough with the resulting poem, I did feel that there was more to say… but finding a way to express it seemed like an impossible task. Simon feels that the toilet is a particularly apt location for THEREFORE to be heard because going to the loo is the one time and place in humdrum daily life where none of us can escape the fact that, ultimately, we are slaves to our own biology.